Retail Alliance is connecting business owners and shoppers through its buy local campaign complete with a mobile app and website, LOVEVA. The nonprofit trade association, established in 1903, supports the growth of local retailers and economy by marketing businesses and providing additional services to grow their consumer base. Now, the Retail Alliance is using the LOVEVA resource as a way for retailers to work together while rewarding shoppers that make purchases at participating LOVEVA businesses. It doesn’t take the most tech-savvy business owner—or user either—to learn how the LOVEVA program works. Retailers listed on the app and on the webpage fit in to its directory based on category of business, each with their own logo, photo, QR code, directions to the business, social media links and information on the types of rewards it has for users. 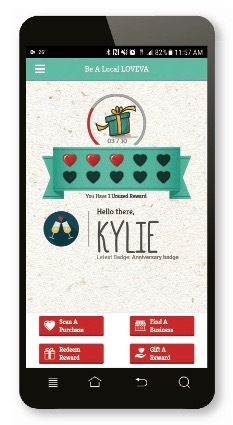 For each purchase at one of over 300 participating LOVEVA businesses in the app, users are rewarded with a heart badge. Once they have collected 10 hearts, they can redeem or share their reward with a friend at any LOVEVA business. Purchases can be as large as a piece of furniture or as small as a cup of coffee, which are each equivalent to one heart. One rewarding example is $20 off a $70 grocery purchase at Farm Fresh, known to be actively involved in the community. In the even bigger picture, shoppers are supporting businesses by keeping money in the local economy. From a business owner’s perspective, the LOVEVA program gives them access to connect to over 12,500 users, which (to date) have made more than 50,000 transactions through the program. The Retail Alliance takes the program even further with additional educational and training resources it provides for its local businesses. “One of things we do is we have membership directors meeting businesses every day, talking to the people about what they need, what they see, who their customers are, what are their issues,” explains Kylie Sibert, Retail Alliance Vice President of Corporate Communications. “We really connect with them in the community that way.” Membership directors also ensure that owners and the front-end staff are up and running on how to use the app and talk about it with the customers through their on-site training. Offline, stores are also given marketing materials, including point of sale flyers to further enhance their message of buying local to customers. Even at events such as Harborfest, LOVEVA offers its buy local clients a free space inside their tent to show off their stores to the public. Retail Alliance’s own effort to better businesses through LOVEVA is a continual, long-term investment. They are constantly monitoring feedback from users and businesses to determine what they want the app to become. Learn more about LOVEVA at BeALocalLOVEVA.com.